Cheap Rugs are great for college, use them 1 year and discard or donate them! Once you put a rug down on your dorm room floor, you'll wonder how you ever got by without a dorm rug. Dorm rugs provide much-needed softness for cold, hard dorm floors; they literally make you feel like you're back at home! You probably don't walk around with shoes on in your house, and your bedroom back home might have a soft, carpeted floor. If you keep shoes on your feet all day and step on that hard floor surface, that dorm room will feel more uninhabitable and unwelcoming by the day! 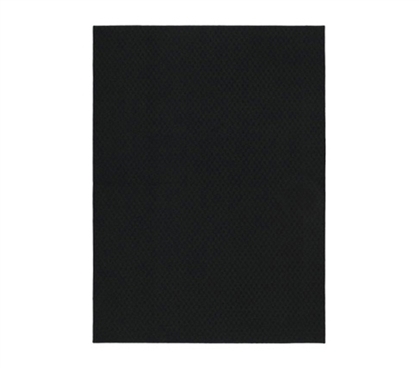 This Standard Black Dorm Rug - 5 x 7 is the perfect remedy. It's large enough to cover the majority of your floor but still won't start encroaching on dorm supplies and covering up dorm furniture. Even in this basic, black color, this rug for college will make your dorm room look nicer and more home-like. As much as rugs for college rooms intend to make feet more comfortable, they also bring some personality to dorm rooms. After all, your dorm room should feel like your dorm room and not just some room with a university-provided bed in which you sleep. Low cost rugs for dorms are that essential dorm supply that'll make dorm living better all around. And since it's a whole 5 x 7 layer of soft material at your feet, you'll get more than used to having this trusted college rug beneath you for all four years of college life. Standard Black Dorm Rug - 5 x 7 About Size: 5' x 7' = Provides that extra feet to be more than just the hang out spot. Often this size is considered the room sized dorm carpet, although it won't take up your whole room it will cover much of the open space on your dorm floor.